It’s hard not to like teardrop campers. Petite, curvy and laced with retro charm, they evoke memories of sepia-toned coastal road trips in an era where seatbelts were optional and sunburnt kids were par for the course. The warm glow of nostalgia paints such bygone days in the most flattering of light, and we in the present day seem inevitably drawn to the flame. Or perhaps those are just my millennial sensibilities; the kind that compel me to seek new age fun with a vintage feel and suffer nostalgia for things I’m too young to have experienced. Either way, I think the Tucana is adorable. I’ll be honest, this is the first time I’ve been up close and personal with a teardrop camper. Sure, I’ve admired them from afar and jabbed one reluctant ex-boyfriend or another in the ribs to exclaim how totally rad that old Valiant is towing one, later lamenting the lost, probably blurry shot as I fail to find my plastic Lomo film camera — but I’d never actually reviewed one. I was only too happy, therefore, to meet up with the crew from Stonegate Industries in the tropical coastal hinterland of Northern NSW to take a closer look at their Tucana camper trailer. This time, thankfully, I had an Actual Photographer with me in the form of fellow Adventures contributor, Dan Everett. He has an expensive camera that shoots in focus and in digital, so I figured it’d be the perfect pairing of old and new. 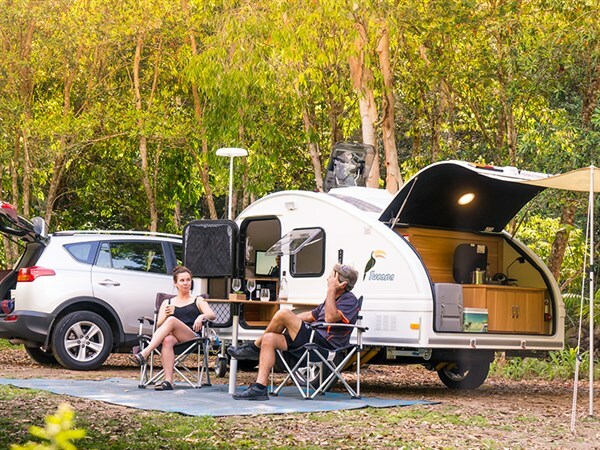 Except not old, because despite its distinct retro styling the Tucana is every bit a modern camper trailer offering the comfort and facilities we demand in 2018. And that all starts with a solid base trailer made to modern standards. The Tucana is built upon a hot-dipped galvanised chassis and has independent suspension with shock absorbers and coil springs. This construction means the Tucana is able to take on good quality gravel roads and compacted sandy tracks, but it lacks the ride height, body durability and dust sealing to be a genuine offroader — a fact freely acknowledged by Stonegate, who ensure customers are aware of the camper’s ideal useage boundaries. It weighs just 720kg Tare with a ball weight of only 45kg, so maneuverability in storage or at camp is a breeze, and towing is safe, simple and doable behind smaller family cars like station wagons and small SUVs. You also won’t blow the budget on fuel. Up front, there’s a storage hatch that houses the gas bottle and provides space for a small amount of gear. As well as its construction, another area the Tucana differs from the teardrops of old is its contemporary power system that, although basic against the most modern standards, is certainly adequate to keep the bird in flight. The Tucana has a 100Ah deep cycle battery with an Anderson plug to charge from your towing vehicle. This is supplemented by a 150W curved, roof-mounted solar panel. This keeps the fridge running, along with the internal and external lights, which are located in all the right places. Oh, and there’s a stereo system and a TV/DVD player too, because a film projector was too bulky and it’s 2018 so please can we just move on. This will come into its own on those unpleasant rainy days at camp, or for we Millennials, a variation on the distinctly more pleasant 'Netflix and chill'. There’s an internal 12V fan too, in case things get too steamy, as they are want to do in the tropics. 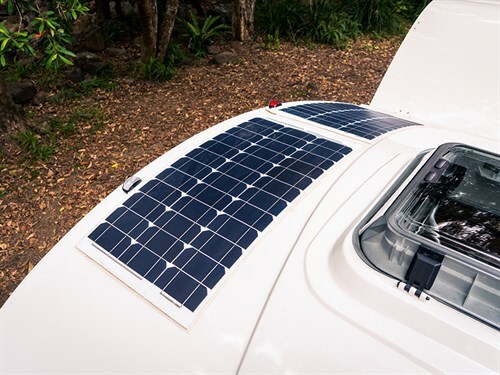 A 1000W inverter charges devices like laptops when you’re away from mains power, although the entire system can be flicked over to mains power when you find yourself camped in civilisation. There are a couple of 240V outlets, two USB ports and a single 12V plug. It would be nice to see an additional 12V outlet at least, should you want to run additional light strips and 12V-powered appliances. The kitchen is housed in the hatch at the rear of the camper under an upward lifting door from which a small awning is assembled with ease. This is enough for sun protection and shelter from very light rain in minimal wind, but if it really comes pouring down, you’re going to get wet while you make your morning cuppa. The kitchen is a basic but functional setup with a three-burner gas stove, a stainless steel sink plumbed through to the 80L water tank via a 12V electric pump and space to house up to an 80L fridge. There are a variety of configurations available, including a fridge slide and additional bench and storage space. The camper on test, lacked both bench and storage space, so I’d be exploring other layouts if I were looking to buy a Tucana. The main outdoor living space is off the side of the camper, where a table is fixed to the camper’s body to provide an outdoor dining area. Personally, I’d prefer to bring my own portable camping table so I can place it anywhere and it’d be more compact in transit, but the gesture is thoughtful and it does mean the camper is self-contained with minimal extra bits of gear required. This area is protected by an awning that slots into a track on the camper’s body and comes complete with side walls should you wish to make this an additional enclosed living space to house kids’ bunks. It’s effectively a dome tent-style setup, so it’s familiar and simple enough to set up. 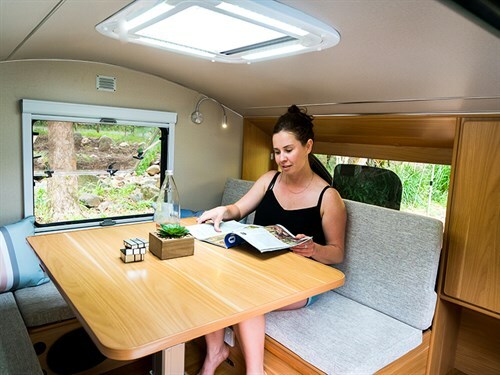 Inside, the U-shaped dinette provides a place to eat or hang out should you wish to escape the elements, and coverts easily to a double bed. The bed head has a hatch that opens the space to the kitchen at the rear, which I found to be a nice touch as it connects two otherwise disparate areas. This allows one to chat to one’s husband as he makes breakfast and it’s easy for him to pass you through a cup of tea to enjoy in bed. Storage comes in a cupboard and two drawers, so isn’t ample but then neither are the dimensions of this super cute camper. There’s no denying it’s cosy inside this wee camper, so those whose person occupies larger dimensions or who has claustrophobic tendencies will probably not enjoy it, however, a camper of this style is always going to be divisive; you’ll either love it or you’ll hate it. I’m a small person with an inclination towards nostalgia and an untamable sense of fun, so I personally would love to spend some time camping in the Tucana. I already have visions of myself rolling into my favourite music festival, the fridge loaded with cheese, pâté and all the gear to make mojitos and my baby blue Tucana (you can have it in almost any colour) turning heads and starting conversations wherever it goes. This camper is about not taking life too seriously, and that’s a cause I’m completely on board with.